Turnover is a part of any college football program, not only with student-athletes, but also with coaches. No where has that been more true in the HBCU world than at Hampton this offseason. Head coach Connell Maynor has brought in four new coaches to his staff in preparation for the 2017 football season, many of them who have previously worked with him previously. There’s new offensive coordinator Duane Taylor, who coached under Maynor at Winston-Salem State. 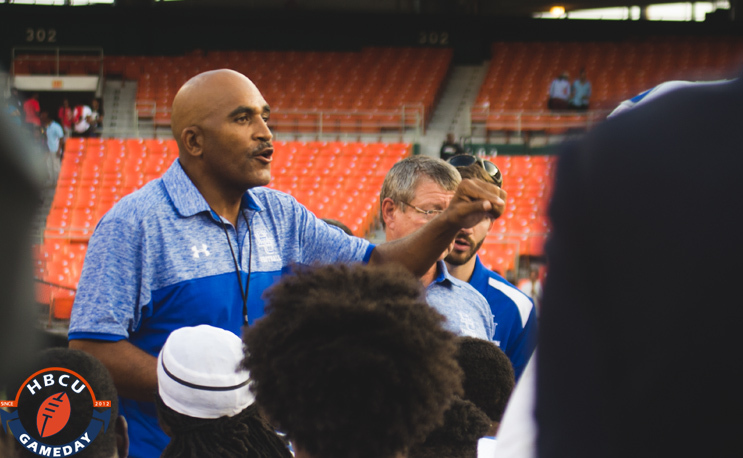 Maynor will be handing over the play calling reins for the first time at Hampton to a man that was a part of WSSU’s 45-7 record from 2010 through 2013. Taylor, who spent last season as Fayetteville State’s offensive coordinator, was receivers coach at Hampton during Maynor’s first two seasons. Jason Mai, Hampton’s new director of football operations and running backs coach, also worked with him at WSSU. Mai was a part of three CIAA championships while at WSSU, two of them with Maynor (2011-2012) with current quarterbacks coach Kam Smith under center. Marcus Dixon doesn’t have a prior Maynor connection, but the new defensive line coach does have a major Hampton connection. Dixon played his college ball at Hampton from 2004 through 2007, winning three MEAC titles under coach Joe Taylor. He went on to play for four NFL teams before getting into coaching. Rounding out the new staff is Johnson “Jeep” Hunter III, the new safeties coach. He has ACC (Georgia Tech) and SEC (South Carolina) experience and has coached on both sides of the ball. There is still one more hire to be made as well. Maynor’s arrival at Hampton was met with high expectations, and so far, his team’s haven’t quite met them. They’ve gone 5-3 in conference play in each of the last two seasons, but have been unable to finish any better than third place in the MEAC or beat North Carolina A&T and North Carolina Central. With both of those teams losing key players from their championship teams, it would appear that the door is open for a team like Hampton or Norfolk State or FAMU to step in and take over, but Hampton lost a lot as well on the offensive side of the ball. This could be a make or break season for Hampton football so they appear to be going for the long ball, in typical Maynor fashion. Those plays usually result in a score or a turnover. We’ll have to see the result come fall. Boo Hampton, long live the SPARTANS! BEHOLD!